This is a challenging game that can be played by a number of players. 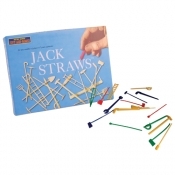 The game dates back many years and is originally believed to of been played using short lengths of straws. These lengths of straw would be gathered together and then allowed to fall into a pile whereupon each player would attempt to pick up a piece without moving any other straw. This modern version of the game now has small plastic items such as saws, ladders, and various implements replacing the pieces of straw but the game still remains the same. The ' Straws ' are held a couple of inches above a flat surface and dropped. Using the hook provided a player attempts to remove one item at a time from the pile without disturbing any other piece. Each piece he collects he puts to one side. If that player moves any other piece then the one he is trying to hook then his turns comes to an end. The following player then picks up the pile that is left, drops them again onto the surface and begins his task of removing one at a time. Each item collected has a numeric value and players add up the points at the end to see who is the winner. A great game for children to aid in co-ordination and numeracy.